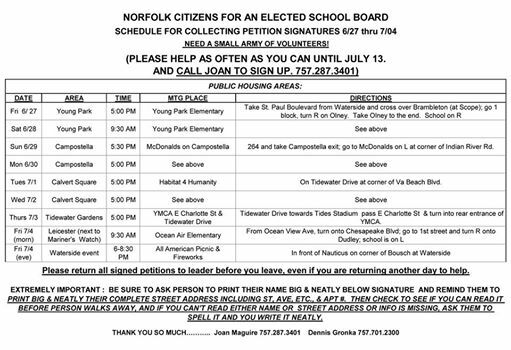 With two weeks left in the petition drive, Norfolk Citizens For An Elected School Board need your help. In addition to the schedule here, the group has obtained permission to be in front of the DMV at Poplar Hall Drive, the DMV at Widgeon Rd, and the Pretlow Library. Volunteers are needed to man the tables there. Of course, if you haven’t signed the petition, you can stop by the locations and do so. Norfolk is one of a few cities in the Commonwealth that doesn’t have an elected school board. Let’s get this on the ballot and let the people decide.